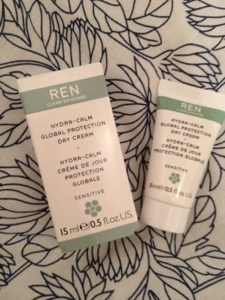 I've been using the REN Hydra Calm Global Protection Day Cream for about a month now. Part of their range for sensitive skin, the day cream hydrates and soothes at the same time. I have been really impressed with REN products since I started using them earlier this year (I also use the Hydra Calm Cleansing Milk). The cream is quite thick and I find I only need just over a pea size amount to moisturise my whole face. It sinks in easily, leaving me with lovely soft skin and doesn't irritate it at all. It has a sort of herbal scent to it, but isn't over-powering and once rubbed it, can't be smelt. Like all REN products, it contains no parabens, sulphates or mineral oil, so is good if you like to watch what ingredients are in your skin care products. The cream retails at £27 for 50ml (mine is a smaller travel size I got as part of an offer) and can bought online from REN or from stockists such as John Lewis, Space NK and Liberty London. 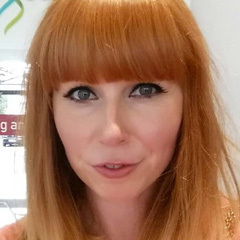 REN are my favourtite brand, I am really enjoying the frankinsense night cream at the moment! It is lovely. They do little starter kits for about £15 if it's something you wanted to try but didn't want to buy the full sizes. I'm glad you like it too :) it makes my face feel lovely!